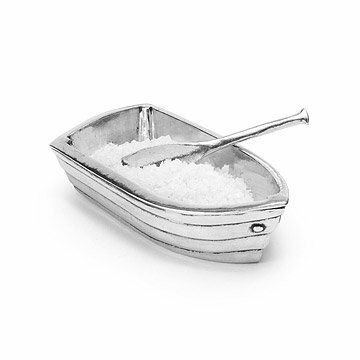 Hand made from pewter, this row boat-shaped salt cellar brings a nautical touch to your table. Bobbing among the silver candlesticks and home-cooked dishes of your table, this little pewter row boat swiftly doles out your favorite salts with a dash of seafaring charm and fine craftsmanship. Handmade in Nova Scotia. Adorable and goes with a water-themed room. Back of the boat says "Salty" which is great character. Nice size- fits in the palm of your hand and is sufficient for a group for several meals, which is nice because you refresh the salt regularly but this size won't get icky quickly. Would be nice if there were a way to affix the oar so it isn't as easily lost or misplaced. This salt seller is too cute! Tiny design which is perfect for where we will be keeping it on the wet bar. Every one loves it! Thought the boat was cute, but I think it should have been a little bigger. Attractive salt server and unique table accent! Product was actually smaller than I thought it would be. Love the look of it but would like it to be half again as big as it is and have a bouy line or some such to attach oar scoop to the boat. Hefty for such a little dinghy! I bought this along with the salad bowl for a Yankee Swap. I loved it so much that I was trying to get it back! Just what my sister collects! My sister collects salt cellars and I've seen this one in your catalog for a few years. I kept saying that I needed to order it for her. She loved it when she open her gifts! Some have complained about the size, so I was ready for that. The truth is, how much salt do you use at a time anyway? I liked that it was made in Canada, was a cute, stylish design and, given that it's pewter, had a bit of heft. Our son is a chef so it seemed a fun little gift. Completely satisfied.